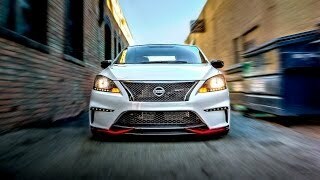 Nissan has displayed the Nissan Sentra NISMO Concept at the 2014 North American International Auto Show, which expands the NISMO lineup. 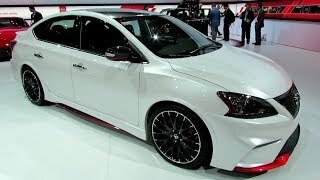 The Sentra NISMO Concept offers an outstanding balance of premium style, innovative technology and fuel-efficient performance. The body is painted in a custom Bright Pearl White with a unique reflective roof panel. Exterior modifications start with a deep front fascia with lower LED lights and wide lower grille that match the stock Sentra's standard LED daytime running rights and upper grille. It also has a wide lower front spoiler and integrated side sills. A custom rear spoiler and center rear fog lamp complete the look. It gets 19-inch RAYS aluminum-alloy wheels. 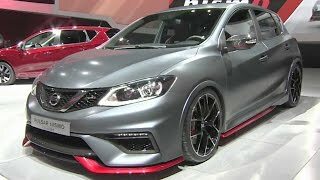 The Sentra NISMO Concept interior features an array of NISMO-inspired upgrades, including Recaro "Sportster" front seats with custom black leather and Alcantara appointments. The rear seats are treated to a mix of perforated black Alcantara in a similar pattern to the front seats. Alcantara is also used for the pillars and headliner. 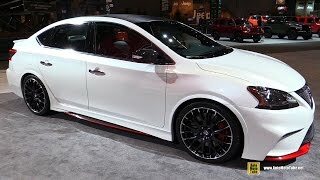 The 2014 Nissan Sentra Nismo Concept is powered by a 1.8-liter DOHC 16-valve inline 4-cylinder engine producing 240 horsepower and 240 lb-ft of torque. It is mated to a 6-speed manual transmission. The power is enough to show its taillights to ordinary sedans.